Trafalgar and Cayton secured semi-final wins against Fylingdales and FILO respectively in the Kenward Cup and Goals Sports Trophy on Sunday morning. Trafalgar had to battle back from 3-2 down with 15 minutes left to secure their place in the Kenward Cup final, winning 6-3 at Oliver's Mount against Fylingdales. Two Billy Logan goals put Traf in charge early on but a brace of goals from Mikey Kilpatrick, his first a low shot which he slipped under keeper Liam Salt and the second a near post finish after an intricate move, made it 2-2 at the interval. Fylingdales keeper Paul Watson pulled off some superb saves after the interval to keep the scores level and a shock win looked on the cards when Barry Heyes lobbed player-manager Salt from 35 yards out in the 75th minute. Salt then decided to come out of goal and play up front, and after Logan completed to level the scores Salt smashed in a late hat-trick to secure Traf's place in the final against either West Pier or Traf Reserves. Salt said: "We should have really won by a lot more as we had a lot of chances but Fylingdales gave it a good go and never stopped working. "It was a good all-round effort from the lads to dig deep and get the win when we went behind so late on." Fylingdales boss John Cuffling added: "I am very proud of all my players today as the lads gave it their all and we looked like we may pull off the win when we went ahead. "Keeper Paul Watson had to pull off some fine saves to keep us in it but all the lads deserves to share the man of the match award as they gave their all. "I think the turning point came when we lost our holding midfielder Dave Shackleton to a hamstring injury midway though the second half, and Liam Salt took advantage of the spaces to take his goals well." A Danny Collins hat-trick steered Cayton to a 5-0 home win against FILO in the Goal Sports Trophy semi-final. After a goalless first half, Collins latched onto a long kick from keeper Corey Towell to lob the FILO keeper from 20 yards and the striker doubled the villagers' lead with a 20-yard volley. Harry Sleep made sure of Cayton's place in the final against Trafalgar Reserves with a neat finish after a one-on-one situation, then Collins completed his hat-trick from the penalty spot. Scott Davison completed the scoring with another clinical finish after being set up for a one-on-one. The star men for Cayton were midfielder Jake McAleese and Towell. FILO boss Les Brown said: "My team let themselves down and they know it, the first half was brilliant but in the second half we looked like a different team. We had a bare 11 due to injuries but we will bounce back. Dan Brown was our man of match." Star man Joe Gallagher scored a magnificent seven goals as West Pier moved into second place in the first division with a 19-0 hammering of eight-man Commercial at Sherburn. Kyle O'Toole also scored four second-half goals, while Jordan Shaw, Dan Jones and Luke Delve all hit two apiece, with Rob Speight and Sam Hyde also on target. 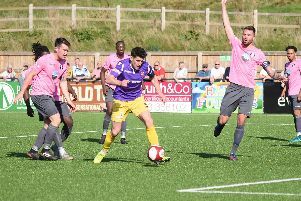 Pier boss Paddy Parke said: "Joe was on great form but you have to give credit to the eight Commercial lads as they kept battling away." Trafalgar Reserves pulled further clear at the top of the second division with a hard-earned 4-2 win at Crown Tavern. Tom Scales put Traf ahead only for David Barber to level, Scales soon restoring the lead with a penalty and Danny Glendinning adding a third before player-boss Leeroy Donaldson pulled a goal back for Tavern before the interval with a free-kick from the halfway line. Both sides went for it after the break and a string of fine saves from Jamie Taylor kept Traf's strikeforce at bay until the 80th minute when Luke Jones sealed the win for Mikey Barker's side. Mikey Anderson was man of the match for Traf on the left flank while Taylor was Tavern's star man. Eric Hall hit five goals as Newlands Reserves coasted to an 18-0 win at 10-man Barrowcliff Reserves. Ryan Matson and Aiden McCallion hit a hat-trick apiece for Liam Mintoft's side, with Callum Myers and Ryan Link also scoring a brace each, the other goals coming from Lewis Weller, Luke Rainton and Rob Whitehead. Defender Josh Young was named as the man of the match for Newlands, with 'Cliff boss Tony Walker hailing the efforts of his 10 players - including himself and assistant Jono Pashby - for their work ethic despite the mounting scoreline.